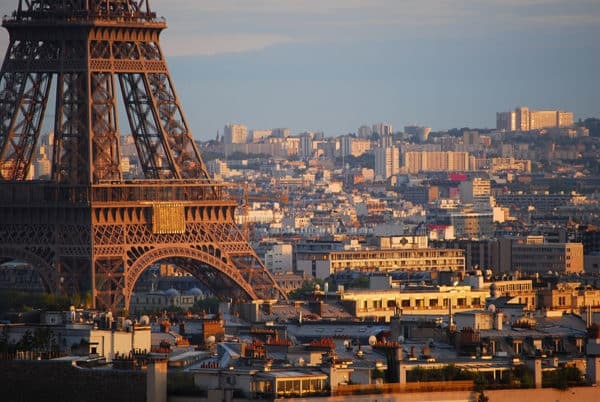 It’s not news that property prices in Paris are on the rise, with the average price per square meter in more than half of Paris’ 20 arrondissements exceeding €10,000. 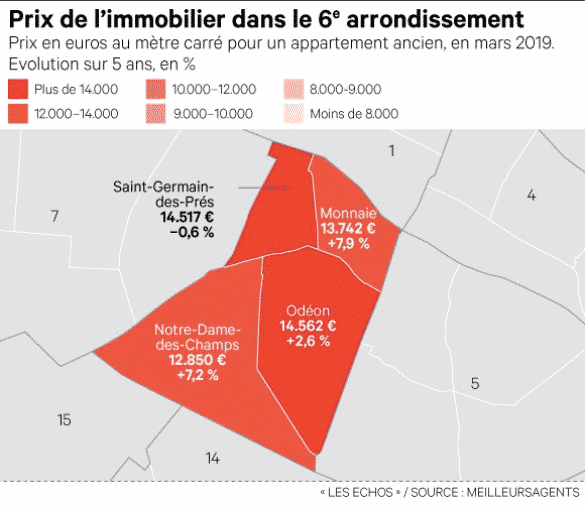 It is interesting to note, however, that price disparities exist between the small boroughs located within each arrondissement. In this article, we zoom in on the 5th, 6th, and 7th. The most expensive areas in Paris, these arrondissements on the Left Bank never cease to attract wealthy families, affluent international buyers, and investors alike. 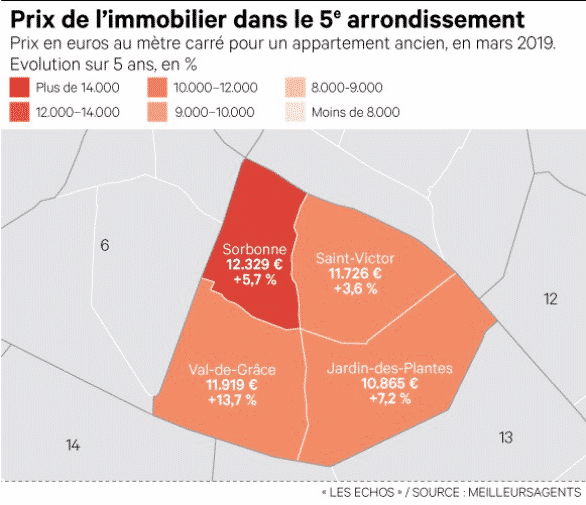 This graphic details the average price per square meter in euros for an apartment in the 5th as of March, 2019, as well as the percent increase of said price over 5 years. 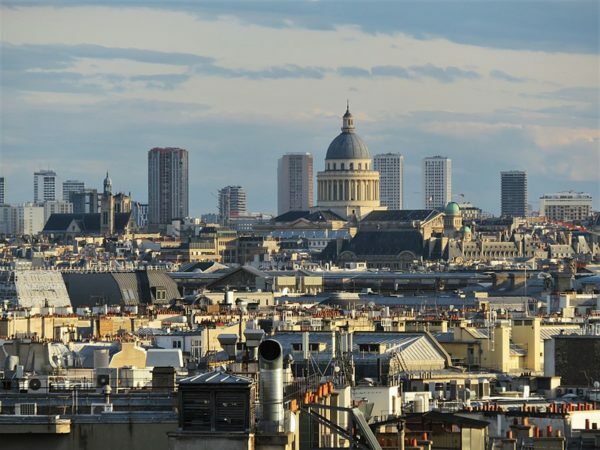 Boasting small-scale spaces (making up 60% of the real estate supply here) and large, bourgeois apartments, the 5th arrondissement attracts investors hoping to capitalize on the student population in the area as much as it does wealthy families. 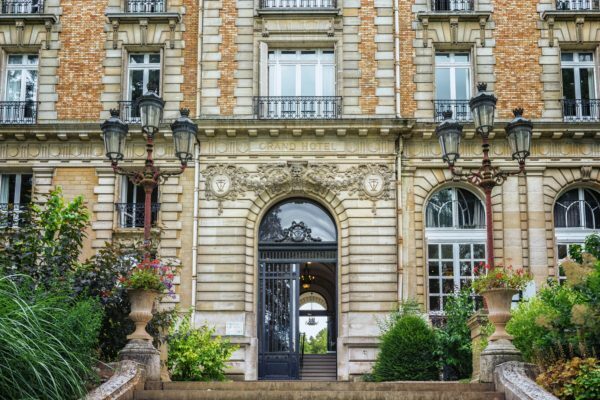 With its strong sense of history and its two parks (the Jardin des Plantes and the Jardin du Luxembourg), the 5th has seen its prices increase by nearly 8% in 2018, according to MeilleursAgents. The current average price per square meter is €11,830. “Prices here are very high. We are close to reaching an average price per square meter of €13,000 for luxury property of all sizes, with demand that continues to remain strong,” notes Patricia Cariou, Director of Monge Patrimoine. The Sorbonne neighborhood extends from the Panthéon down the hill to the Jardin du Luxembourg. 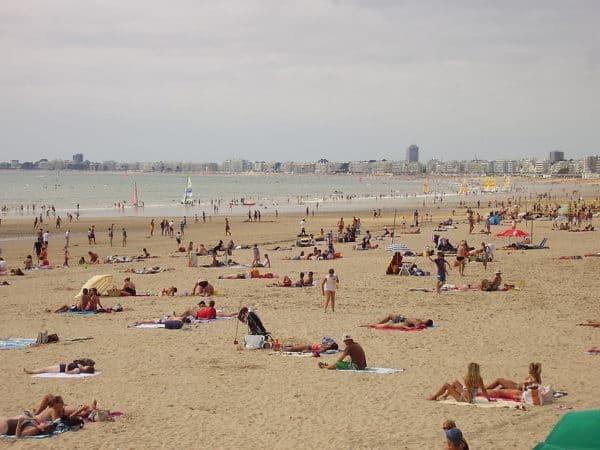 In this area, favored by tourists, the price of an apartment currently rests around €12,290/m², after an increase of over 4% in 2018, according to MeilleursAgents. Although there are still quite a few large apartments up for grabs here, the market is primarily driven by small studios, which are very popular with investors. On rue Saint-Séverin, a 21 m² space recently sold for €250,000, or just under €12,000/m2. 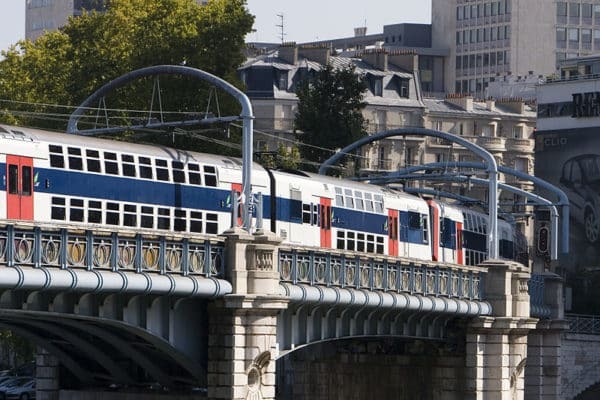 Closer to the Seine, prices continue to rise. “If a space is truly high-end, we can ask for more than €14,500 per square meter,” adds Patricia Cariou. 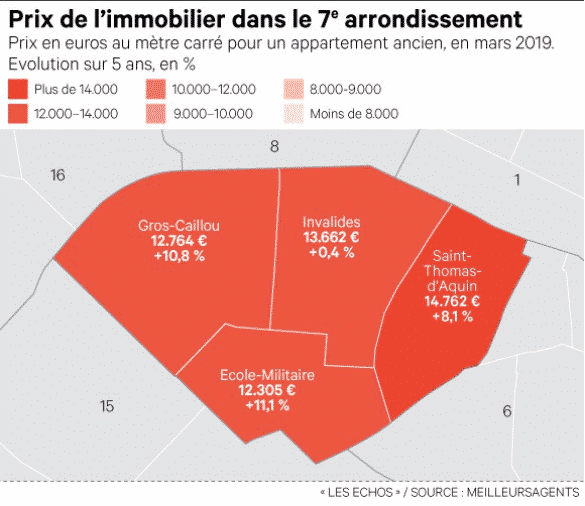 Although it remains the most affordable area of the 5th arrondissement, it takes more than €10,000 euros per square meter on average to buy between Sorbonne Nouvelle and gare d’Austerlitz. “The area around the station is evolving and many investors are looking there to find a better rental return,” explains Patricia Cariou. Large apartments are always particularly sought after, adding to price increases in the area. 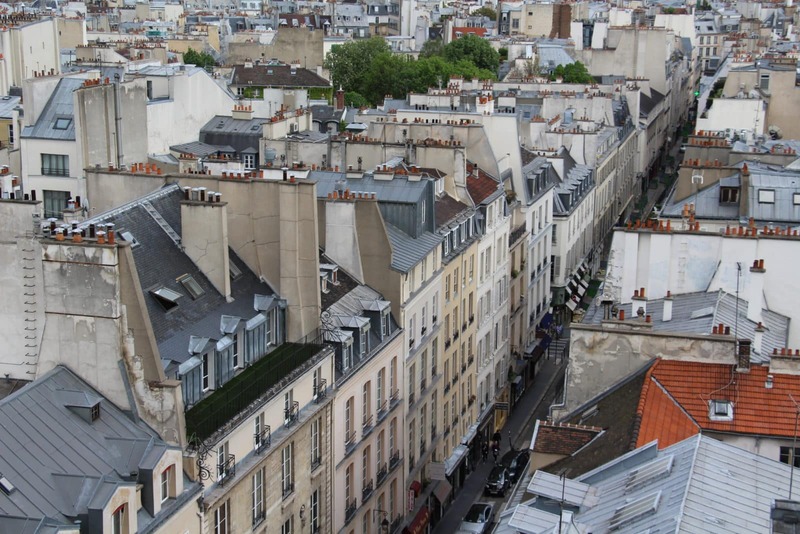 An 83 m² apartment on rue de Vésale was sold for €1,200,000, more than €14,000/m². In the Saint-Victor and Val-de-Grâce area, the market has been reinvigorated over these last two years, with price increases of more than 9%. Not far from les Arènes de Lutèce, this area continues to attract buyers appreciating its rich history. On rue Linné a 5-bedroom apartment at 114 m² was sold for €1.15 million, which is less than the €11,640/m² average in this area. The same trend has been noted in neighboring Val-de-Grâce, although some disparities have been observed as the price per square meter can reach up to €14,000 as you get closer to rue d’Ulm. This graphic details the average price per square meter in euros for an apartment in the 6th as of March, 2019, as well as the percent increase of said price over 5 years. The 6th is Paris’ most expensive arrondissement. 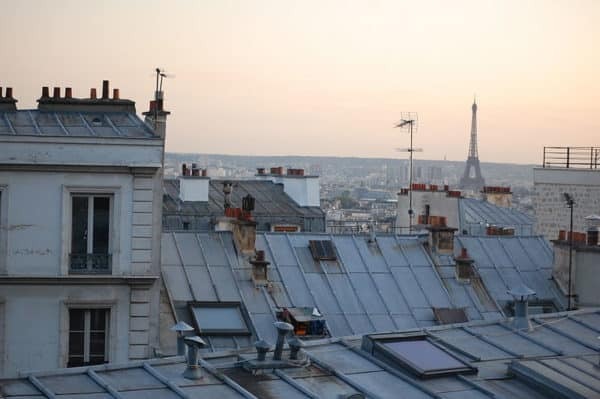 The average price of an apartment here is around €13,700/m², according to MeilleursAgents, having increased 3% over 2018. It is not rare, however, to see properties exceed €25,000/m² in this saturated market, where competition between buyers increases prices. “This is a privileged area attracting wealthy foreigners and those working in finance and business, it’s rare that first-time buyers find themselves searching here,” notes Inès Fonteneau of Féau Saint-Germain. 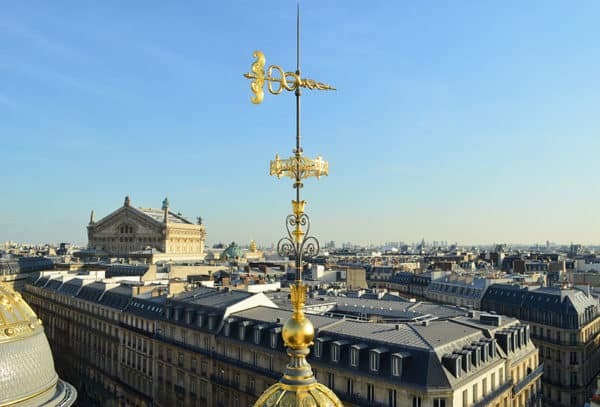 Although prices in the Saint-Germain-des-Prés sector of the 6th have only gone up by 1.4% over the past year, they are some of the highest in the city. The price per square meter in this neighborhood hovers around the €14,500 mark, making it the third most expensive in the capital. Additionally, two of Paris’ five most expensive streets are found in this area: rue de Furstemberg and rue de l’Abbaye. Along these streets, interested buyers can expect prices to start around €20,000 euros/m². The presence of le Jardin du Luxembourg, located in the heart of the 6th’s Odéon area, has increased property prices between boulevard Saint-Germain and rue d’Assas. With the average price per square meter for an apartment running around €14,430, this borough is the 5th most expensive in the capital. Although the most affordable sector in the 6th, Notre-Dame-des-Champs is still not within everyone’s financial reach. Prices have risen by 10% in the last two years, with the average price per square meter currently fluctuating around €12,800/m². Boasting more shops and storefronts than its neighboring sectors, Notre-Dame-des-Champs owes it’s liveliness to the two large streets that cross it: rue de Sèvres and rue de Rennes. On rue de Rennes, a 95 m² four-bedroom apartment sold for €1.4 million (€14,000 euros/m²), far beyond the average price per square meter. “This is an area favored by families due to its numerous schools and green spaces,” details Inès Fonteneau. This is also an area where families won’t have a hard time finding larger apartments. On boulevard Raspail, a 173 m², 6th floor apartment, was sold for more than €2.8 million. This graphic details the average price per square meter in euros for an apartment in the 7th as of March, 2019, as well as the percent increase of said price over 5 years. Home to embassies, ministry buildings, and world-renown museums & cultural sites, the 7th boasts a varied real estate market, with as many small apartments as larger units. This area attracts wealthy families and prosperous foreign buyers hoping to take advantage of the solid investment potential the 7th offers. “Since the end of 2018, we’ve noticed increased interest in the 7th linked to Brexit with the return of French citizens from abroad who have a high budget at their disposal,” analyzes Dominique de Saint Priest, from the Era Saint Priest agency. 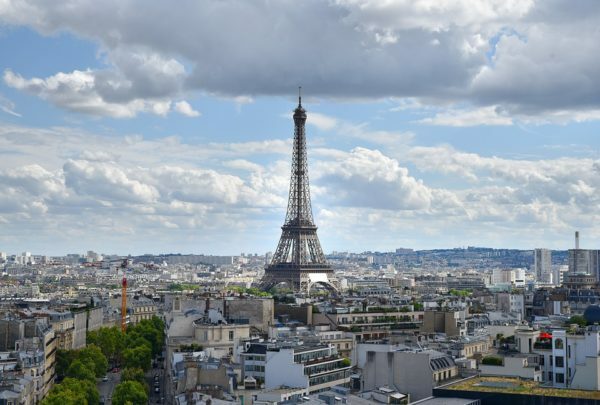 Although the average price per square meter in this arrondissement is around €13,300, some luxury properties sell for as much as €30,000/m2, especially those with a view of the Eiffel Tower, which can automatically double, or even triple, the price point. 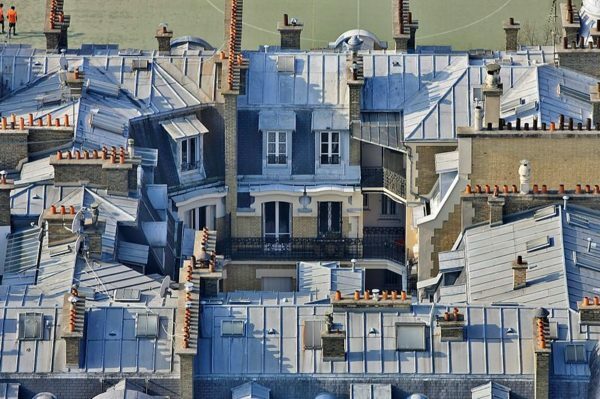 On the Champ-de-Mars, a 191 m² apartment sold for €3.7 million, well over €18,000/m2. Near École Militaire, prices are a bit more affordable. Having increased around 5% over the last two years as reported by MeilleursAgents, the average price per square meter here has plateaued under €13,000. Sales above this average, however, aren’t a rarity: a two room apartment at 33 m² on rue d’Olivet was sold for €550,000 euros (about €16,700/m²). Between its high-end shops like Le Bon Marché and the new Beaupassage, and its cultural sites, like the Musée Maillol and the Palais Bourbon, the Invalides and Saint-Thomas d’Aquin sectors of the 7th radiate luxury. Properties in these two areas rarely go for less than their €14,000/m² average. Along the large avenues, apartments sold for several million euros are nothing new. “Smaller apartments don’t experience very long market times either,” specifies Dominique de Saint Priest. On rue de Verneuil, close to the former residence of Serge Gainsbourg, a 31 m² apartment was recently sold for €485,000 euros (€15,645/m²).